This conclusion is reaffirmed as Peter and John come investigate and see new evidence, that the burial cloths are rolled up. Mary then sees more evidence proving her theory, when a gardener appears who is suspiciously lingering around the area after the tomb was emptied. Mary now approaches him as a suspect: this man may have taken Jesus away! Only when he calls her by her name, does she recognize him as Jesus, and this final piece of evidence rules out her previous conclusion. But after Mary tells all the disciples, and even they see Jesus in person, Thomas remains unconvinced. Thomas will not believe until he sees the actual marks of the nails and is able to touch them. 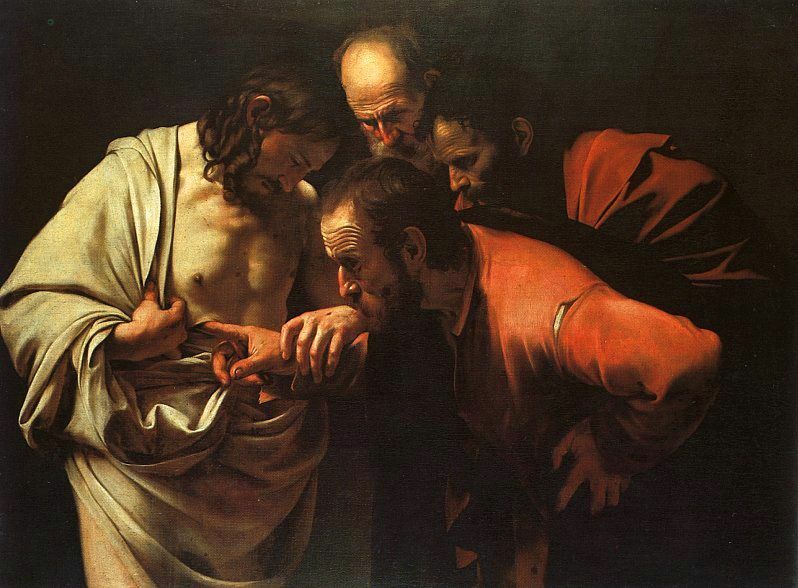 Thomas demands this higher standard of evidence before he will come to the same conclusion, and eventually even he is persuaded by new evidence, as Jesus appears and lets him touch his wounds. It’s not enough to just show up and file a paper stating that you deserve a legal remedy of some kind, or to show up to a criminal case and say “Clearly I didn’t do it.” And neither can the other side make such a simple announcement; evidence is necessary to actually prove the case on its merits. This might include objects, documents, sworn statements, or live testimony from witnesses. Evidence may be as fleeting as tire marks which disappear, or as firm as a statue that will now stand headless for centuries. Every person who is a party to a case has the right to present evidence and witnesses that can prove the case; the problem is that there are standards that must be followed before anything can be admitted to the court. The court may require a preponderance of evidence (a greater than 50/50 conclusion), or it might require enough evidence such that no reasonable person would have any doubt at all. Additionally in Illinois, as in most states, evidence must be relevant and non-prejudicial, relating to facts and not opinion or character. Documents must be authenticated by people who know where they came from, and legally permitted to be disclosed. Witnesses must have actual knowledge and be willing to face cross-examination and possible impeachment. Finally, most testimony or documents claiming statements were made by other people are almost always excluded as hearsay. As in my last post about the trial of Jesus, the discussion above is not meant to prove or disprove any doctrines of Christianity. Rather it should emphasize that preparing a case should always involve strategic planning as to how evidence will be presented. A judge or jury may either be more like Mary Magdalene or more like Thomas in terms of what evidence is enough to persuade them to a conclusion. If you are planning for a case that might end up in a trial, you may want to call an attorney as soon as possible for help with gathering and presenting evidence, as it might make the difference between how your case ends. This entry was posted in Other Areas and tagged documents that prove my case, resurrection legal issues, what evidence do i need, who can i get to be my witness. Bookmark the permalink.